radiation very early in evolution. Today plants have a number of adaptations that help to filter UV radiation, including pigmentation, secondary compounds, and cuticle. It is not known precisely when photosynthetic organisms began to exploit terrestrial habitats. Some have suggested that cyanobacteria existed in shallow pools on the earth's surface relatively early in geologic time (Westall et al., 2006b; see Chapter 2). 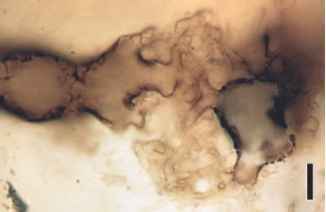 We do know, however, that beginning in the Ordovician there is evidence of organisms with characters suggesting that they lived in a desiccating environment. For many of these organisms, it is not known whether they existed for all or part of their life history on the land, but many demonstrate features that are today found only in land plants. fossils that exhibit some but not all features of land plants, (Edwards et al., 1998a) even though some are well preserved and have been intensively studied. Some of these organisms have been compared to vascular land plants, whereas others have a morphology or internal organization different from any other living or fossil group (Edwards, 1982). We discuss several of these unusual organisms in the section that follows. The nematophytes or Nematophyta (Strother, 1993) is an informal grouping of enigmatic Silurian-Devonian organisms that range from tiny millimeter-sized structures to several-meter-long "logs." Their plant bodies are constructed entirely of variously sized and shaped tubes. Although nematophytes have been studied intensively for more than 150 years, little is known about their systematic affinities, biology, and ecology. figure 6.1 Cross section of Prototaxites showing eccentric incremental growth (Devonian). Bar = 3 cm. figure 6.2 Longitudinal section of Prototaxites southworthii showing three types of tubes: A. binding, B. generative, and C. skeletal (Devonian). Bar = 50pm. figure 6.3 Section of Prototaxites southworthii showing large skeletal and narrow binding tubes/hyphe. (Devonian). Bar = 50 pm. 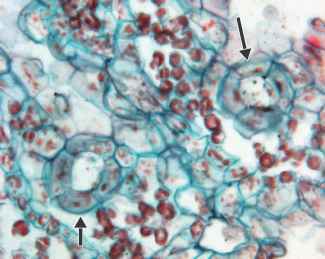 "tissue" made up of these hyphae, along with the presence of well-defined borders of growth increments (FIG. 6.1) marked by increased tissue density, suggests some type of periodicity in growth. 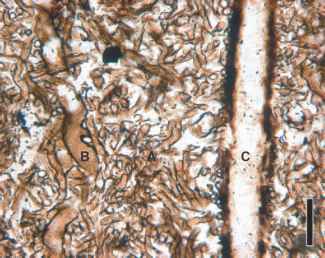 In addition to the tubes, numerous lacunae are scattered throughout the pseudoparenchyma. These spaces often contain disintegrated tissue and occasionally tubes, and are interpreted as formed as a result of some type of parasite. When this gigantic nematophyte was initially discovered, the specimens were believed to represent some type of fossilized conifer wood, and the organism was named Prototaxites (Dawson, 1859). After closer examination, however, the fossils were reinterpreted as algal like, transferred to another genus (Nematophycus) , and formally classified with the Codiaceae (green algae). Prototaxites has also been compared to the brown alga Lessonia (Carruthers, 1872b; Krausel, 1936). When tubes of P. southworthii were examined ultrastructur-ally (Schmid 1976), however, distinct cross walls (septa) were identified, each with a centrally located elliptical aperture or pore (FIG. 6.4) . These pores are superficially similar to the pores and pit connections found in certain red algae, but corresponding structures also occur in fungi (e.g., basidiomyc-etes) in the form of doliporous septa. In some of the tubes or hyphae, small outgrowths occur close to the septa that remotely resemble basidiomycetous clamp connections (Hueber, 2001). figure 6.7 Francis M. Hueber. in the Waxweiler quarry in Germany, and interpreted as a portion of the basal holdfast of this organism (Schweitzer, 2000). 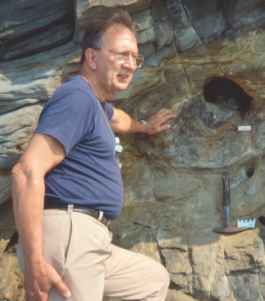 It should be noted, however, that M. helteri and Prototaxites have never been found in organic connection, and it remains questionable as to whether they actually belong to a single organism. 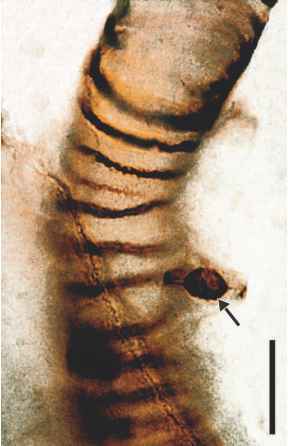 The most recent interpretation of Prototaxites is the comprehensive paper on P. loganii by Hueber (2001) (FIG. 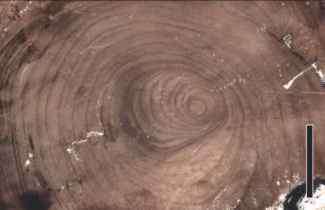 6.7), who hypothesizes that the large "logs" represent a giant (FIG. 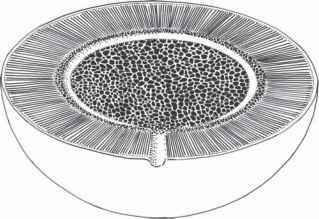 6.8), terrestrial, saprotrophic organism that may belong with the basidiomycetes (Chapter 3). Thus far, however, there are no easily identified structures that would support the assignment to the basidiomycetes or any other fungal group. Carbon isotope analyses of Prototaxites and land plants that lived in the same environment indicate that Prototaxites has a much wider variation in its C 1 2/C13 ratio than would be expected in any plant (i.e., autotroph), indicating that Prototaxites was a heterotrophic organism (Boyce et al., 2007). 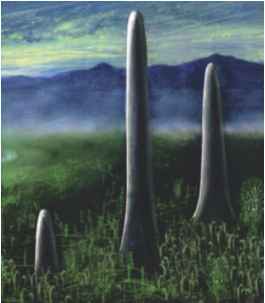 Although a heterotroph the size of Prototaxites remains a possibility, the structure of the typical Late Silurian-Early Devonian ecosystem, which consisted of a sparse vegetation of exceedingly small plants and probably algal and cyanobacterial growths, brings into question whether there would be a sufficient source of carbon in the ecosystem to support a heterotrophic organism more than 8 m tall. Still another suggestion is that Prototaxites is an example of an ancient mutualistic association of two (or more) different organisms that combined both heterotrophy and some level of a lichen-like nutritional mode (Selosse, 2002). Although there is no direct evidence of an associated photobiont within the permineralized specimens, the hypothesis has some merit. Perhaps the photobiont consisted of cyanobacteria that were associated with the outer surface of the organism and that have either not been preserved or simply unidentified to date. Regardless of whether Prototaxites was an alga, a fungus, a lichen-like association of several different organisms, or some other type of life form not remotely related to any modern organism, it must have presented an imposing structure. As increased attention is directed at the evolution of early terrestrial ecosystems, it will be interesting to see where the affinities of this unique Paleozoic organism eventually reside. Perhaps the earliest detailed account of an enigmatic organism initially believed to represent an early land plant was Lang's (1937) description of Nematothallus from the Lower Devonian of the Welsh borderland. Specimens of Nematothallus are flat, thallus- or leaf-like, and only a few centimeters in diameter. Like Prototaxites, they are composed of a system of interlacing tubes, often of two distinct orders of size (some with internal thickenings), and usually covered by a cuticle with a pseudocellular pattern (Strother, 1988, 1993). Isolated cuticle sheets of this type are known from the Ordovician to the Early Devonian, and have flanges on the inner surface that would be interpreted as marking the outlines of epidermal cells if found on a vascular plant. Scattered among the tubes and within the cuticle are spores of various sizes (Strother, 1993). It is not entirely clear, however, whether the spores, tubes, and cuticle-like layers actually represent parts of the same organism. Perforations up to 100 pm in diameter are present on some of the cuticles and these possess various types of thickenings near the surface. Like the pores found in other enigmatic organisms and modern liverworts, those of Nematothallus may have functioned in some form of gas exchange. Edwards and Rose (1984) noted, however, that similar pores have not been found in all Nematothallus cuticles. Other possible functions for the cuticle pores in Nematothallus 1 as well as those found in some other Paleozoic enigmatic organisms of this type, include sites of gamete liberation or a response to wounding. Corsin (1945), Jonker (1979), and others have suggested that Nematothallus represents the remains of leaf-like structures that were produced on Prototaxites-like axes. Although this is an interesting hypothesis, no specimens in organic connection are currently known that might support any of these hypotheses. Strother (1993), after examining a large assemblage of Nematothallus-like organisms, suggested that the construction of these organisms may be indicative of a subaerial habitat. Nematoplexus rhyniensis is a silicified, thalloid fossil known only from incomplete, partially decayed, and generally fragmentary remains from the Rhynie chert (Lower Devonian). The overall morphology and size of the organism remain unknown. It consists of a meshwork of interlaced aseptate and septate tubes of two or three different sizes (Lyon, 1962). Most of the larger, aseptate tubes have annular or helical thickenings; some of the narrow, smooth-walled tubes display distinct septa with a centrally located elliptical aperture or pore (FIG. 6.9). 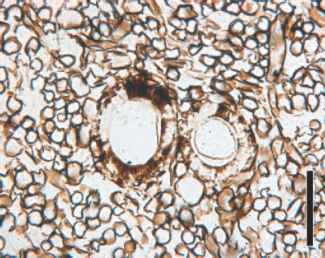 These pores are similar, if not identical, to the pores found in Prototaxites. 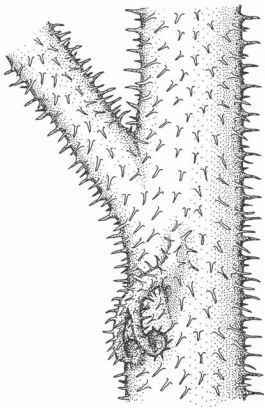 Nematoplexus tubes apparently do not branch, except for certain areas termed branch knots in which aggregations of tubes form dense, multi-branched clusters (FIG. 6.10 ). 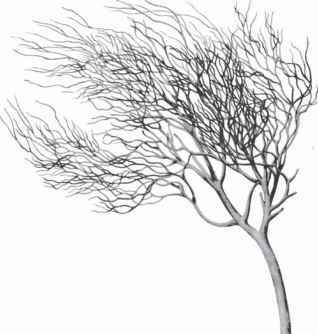 The biological significance of the branch knots remains unknown. It has been suggested that N. rhyniensis may represent the permineralized equivalent of Nematothallus. A second, even less well-documented and understood nematophyte from the Rhynie chert has been given the name Nematophyton taiti (Kidston and Lang, 1921a). but offer equally plausible reasons to refute inclusion in either group. Instead, they place both genera in the Nematophytales, an order erected by Lang (1937). Burgess and Edwards (1991) later developed an artificial classification system, based on one used for dispersed palynomorphs, to aid in description and comparison of some of these organisms constructed of various types of tubes. This genus is known from the Late Silurian to the Middle Devonian (Barber, 1889, 1891; Stockmans and Williere, 1938; Lang, 1945; Schmidt, 1958), and is often cited in discussions of possible land plant origins. Pachytheca specimens are small (0.1-0.6 cm in diameter), spherical, and organized into two distinct zones (Niklas, 1976c; Gerrienne, 1991). 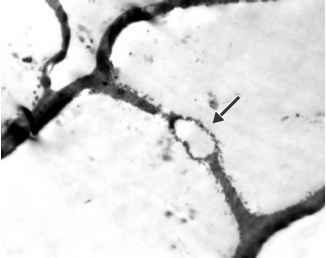 The inner zone (medulla) consists of densely spaced, intertwined tubes (FIG. 6.12), whereas the outer layer (cortex) is constructed of tubes that are distinctly radially aligned. Between cortex and medulla is a narrow area in which the tubes seem to change from random to radial alignment. In some specimens, a narrow canal is visible that appears to connect the medulla with the exterior. Pachytheca has repeatedly been interpreted as a dispersal unit (cystocarp) of Prototaxites (Schmidt, 1958; Jonker, 1979; Schweitzer, 1983); however, fossils in organic connection have not been discovered to date. Niklas (1976c) suggested that Pachytheca represents the juvenile form of Parka decipiens (discussed below), and thus the two taxa are merely different ontogenetic stages of a single organism. In an interesting set of experiments, Graham et al. (2004) observed extant specimens of the liverworts Marchantia and Conocephalum at various stages of controlled tissue degradation. Based on the results of these experiments, they suggest that some of the enigmatic fossils commonly referred to as nemato-phytes may represent remains of ancient liverworts in various stages of decay and that some of these plants shared certain features with modern marchantioids. Although these authors do not suggest that extant liverworts existed in the Devonian, they discuss the possibility that some of the cuticle sheets and tubes of these extinct forms may represent characters that have persisted during the evolution of the group (see Chapter 5). figure 6.13 Airpores (arrows) in Marchantía thallus. (Extant) Bar = 100 |im. When did photosynthetic organisms began to exploit terrestrial habitats?